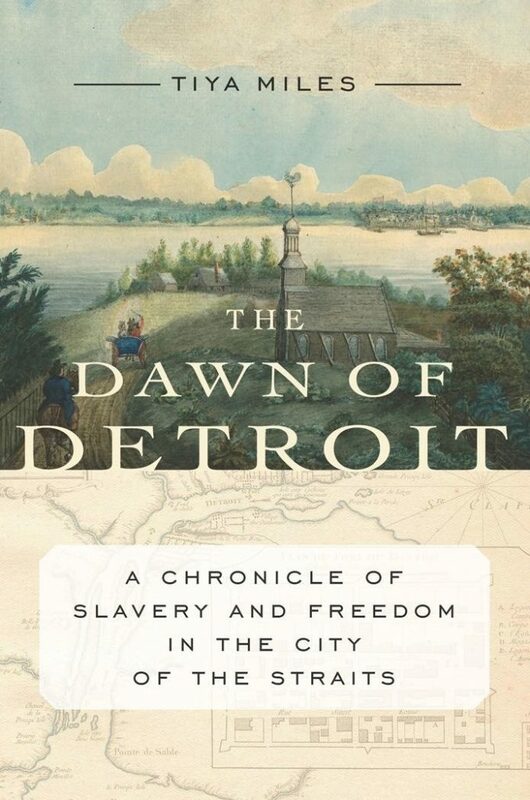 In today’s post, Alaina E. Roberts, the Dietrich Diversity Postdoctoral Fellow in the Department of History at the University of Pittsburgh, interviews Professor Tiya Miles about her new book, The Dawn of Detroit: A Chronicle of Slavery and Freedom in the City of Straits (The New Press, 2018). Miles is the author of three prize-winning works of history: Ties That Bind: The Story of an Afro-Cherokee Family in Slavery and Freedom; The House on Diamond Hill: A Cherokee Plantation Story; and most recently, The Dawn of Detroit: A Chronicle of Slavery and Freedom in the City of the Straits. She has also published historical fiction, The Cherokee Rose, a travel narrative on historic sites of slavery, Tales from the Haunted South, and various articles and op-eds on women’s history, history and memory, Black public culture, and Black and indigenous interrelated experience. 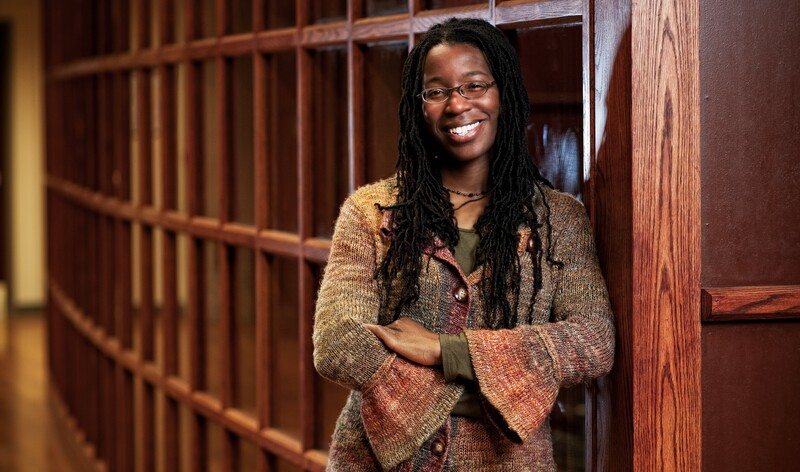 She is a MacArthur Foundation Fellow, a Mellon Foundation New Directions Fellow, and a National Endowment for the Humanities Public Scholars Award recipient. She taught on the faculty of the University of Michigan for sixteen years and is currently a Professor of History and Radcliffe Alumnae Professor at Harvard University. Follow her on Twitter @TiyaMilesTAM. Alaina Roberts: By bringing together previously distinct historical narratives, that of the fur trade and of chattel slavery, you provide a model for examining different modes of slavery, ownership, and captivity simultaneously. This allows you to uncover the different ways Black and indigenous bodies were used for labor that have not previously been explored—for example, using enslaved Black men to “finish furs.” Why do you think it has taken so long for historians to combine these narratives, and what have they lost by not doing so? Tiya Miles: I think we all suffer from narrative attachment. We learn history through various set story frames, and it becomes difficult for us to recognize that those frames are in place, let alone to see around them. Working on a project located in the Great Lakes increased my awareness of how regionally overdetermined our story frames are. We expect certain racialized bodies to belong in certain places, so we see the fur trade of the Midwest as a red-white drama and project Black people and the histories we associate with them onto other regions, namely the South and, more recently, the urban Northeast. Even though I was steeped in this primary material, it took me quite a while to realize the research revealed a different racial reality behind that familiar fur trade narrative. But once I glimpsed the outlines of an altered story frame, I was able go back to secondary sources and identify wonderfully provocative snippets in the work of previous scholars of the Great Lakes, such as Helen Hornbeck Tanner. Roberts: It has been notoriously difficult to find and verify sources about Canadian slavery, especially about enslaved Black women. You cite the author of one of the only books on enslaved Black Canadian women, Afua Cooper. What allowed you to overcome this difficulty in source procurement? Did you unearth sources that no one had looked at before? Or did your dual focus on indigenous captivity and slaveholding provide access to different, more available sources? Miles: Although I was painfully aware of the limitations (and biases) of telling this Detroit story within a US national narrative trajectory (essentially Pontiac’s Rebellion to the Revolutionary War to the War of 1812), I gave myself permission to structure the book in this way. Part of my decision stemmed from the hope that Detroiters might be inspired by seeing how the city was integral to great national dramas. In addition, I didn’t feel equipped to tell the story of Canadian slavery in all of its duration and complexity. Afua Cooper’s work was critical to my thinking as much for the concepts she advances as for her specific research on Angelique’s story. I also found the data-rich scholarship of French Canadian historian Marcel Trudel to be fundamental to the project. The multifaceted story of the US-Canadian northern border is begging to be thoroughly researched and reconstructed. This book was just one small step in that direction. I look forward to the many other studies that are currently in the pipeline and yet to be written. Roberts: This book corrects a number of myths about the North and Midwest, such as the belief that the Northwest Ordinance completely abolished slavery in the territories which it covered, or that Canada was consistently a destination of freedom for people of African descent throughout North America. What are some other myths about the Great Lakes region that you specifically wanted to dispel? Miles: You’ve articulated the main myths that I found myself working through in the project. Another myth is that Midwestern history is mostly white American history (and maybe also American Indian history up to some cut off point in the distant past) as opposed to being richly diverse from the beginning—starting with the multiplicity of Native communities that called the region home, an “infinity of nations,” as my colleague Michael Witgen has termed it. Another myth, frankly, is that the Midwest is boring and parochial. As an Ohioan by birth, this latter notion was one that I was on a secret mission to challenge. Roberts: Richard White’s The Middle Ground: Indians, Empires, and Republics in the Great Lakes Region, 1650-1815, has dominated conversations on the Great Lakes region since its 1991 release. But you complicate his idea of a “middle ground,” and suggest a framework which includes unfree people, who did not have the consistent ability to negotiate this “middle ground.” How did the Huron term for the Detroit riverbank, “the coast of the Strait,” help you arrive at this framework? Miles: People who frequent or reside in a place for centuries and millennia know it better than newcomers like me. This old indigenous notion of Detroit as a coast, rather than a terrestrial town, opened up the project conceptually. It encouraged me to think about the nature of a coast—a strip that connects and at the same time separates two different kinds of matter—and to imagine the Detroit River region as an area of multiple and overlapping bordered zones (geographical, political, social, and racial). Once I began to visualize people living in this space characterized by a coastline dividing land from water, I could see their uneven, unequal status more clearly. It occurred to me then that some residents of Detroit (those who were free) stood on relatively firm ground (albeit in a negotiated and often violent “middle”) and that others (the enslaved) were forced to operate from a treacherous place of instability. Roberts: Although all of your books are attentive to landscape, this one is particularly interested in the natural world—after all, the whole draw of Detroit for Native peoples and white colonists was its landscape, particularly its waterways. Did current environmental issues in the United States, and especially nearby in Flint, Michigan, as well as your own passion for environmental awareness, inform the direction this book took and the social issues you reference throughout? Miles: I realized several years ago that although my histories of Cherokee slavery unfolded on farms and plantations, I was missing the opportunity to think more seriously about land and other features of the material (or natural) world in a way that might enrich my attempt at understanding. The Detroit study seemed to demand a greater awareness of environmental history for reasons that your question highlights, so I applied for a Mellon New Directions Fellowship to seek an orientation to the field of environmental history. I spent a year talking and studying with colleagues at Montana State University where there is a strong faculty cluster in this field, and I learned to ask new questions. My study of Detroit is not an environmental history per se, but it does bring in a consciousness not only of the critical import of the material environment to histories of race and power, but also of the notion that non-humans, such as rivers and beaver, have and deserve their own histories. Roberts: There is so much work to be done on the intersections of free and unfree labor, and of Native and Black life in North American history. In what geographic region will you situate your next book? Miles: There is indeed. I’m looking forward to learning from new studies underway on topics like Native women in southern slavery, Native involvement in the Abolitionist Movement, the Civil War in Indian country, and Black freedmen and women in Reconstruction-era Indian Territory. My next book on Black enslaved women’s creativity will take me back to the Southeast. And of course, the South was a Native place where indigenous enslavement and Black enslavement occurred on the same ground. I also have simmering on the back burner a novel inspired by the Underground Railroad material that I gestured toward but did not explore in Dawn of Detroit. Then I’m planning a big leap westward to look at the lives of Black women and families in Montana during the buffalo soldier era. Copyright © AAIHS. May not be reprinted without permission. Alaina E. Roberts is currently the Dietrich Diversity Postdoctoral Fellow at the University of Pittsburgh. She received her PhD in History from Indiana University. Her current manuscript project examines the intersection of Black community-building and indigenous nationalism in the Reconstruction west. Sign up to get the latest posts and updates. Each author’s posts reflect their own views and not necessarily those of the African American Intellectual History Society Inc. AAIHS welcomes comments on and vigorous discussion about our posts. We recognize that there will be disagreement but ask that you be civil about such disagreements. Personal insults and mean spirited comments will not be tolerated and AAIHS reserves the right to delete such comments from the blog.